hmmm...I bet that blog title got your attention, now didnt' it! With this challenge the Bloggers Challenge Group reaches a milestone - we're 1 year old! What started out as a conversation between Sheryl and I on "what inspires you to create", has become a weekly inspiration for many blog readers. I'm grateful to have so many talented people participating in these weekly challenges. This weeks challenge was to create a card with a "manly" theme....when I was planning the challenges I had it in my mind that BC52 should be "celebration", but I my hands didn't type what I was thinking...So here' you have my "manly celebration" card....boys can be men too! I'll be giving this one to my son for his birthday in August. To create my card, I used some my newly acquired goodies....First I picked out my background paper from my new stash of Paper Loft Paper - here I used Court Jester. My image is from Cornish Heritage Farms - Rummage Bin Line, Boys will be Boys. I stamped and colored my image with Adirondack Pigment Inks and clear embossed. I can't wait to learn more about these next month at CHA - I'll be attending the All Things Adirondack Class taught by Tim Holtz - I'm super excited! My numbers are from the monogram stamper line from Just Rite Stampers . If you'd like to play along with this weeks challenge, just leave a link in the comments to your card. If you upload to SCS, you can use keyword BC52, so your challenge is easy to find. Have a super Friday - thanks for stopping by! Wonderful job, as always Lisa! I know your son will love it! Great card Lisa. This image is so dern cute! Thanks for all you do to keep us challenged and on our toes! You rock! Girl, you are just too talented! This card is fabulouso. Thanks so much for inviting me to be a part of this talented group of gals who have truly inspired me each week. Looking forward to being a part of it in the upcoming year! Hey, GF! Thanks for running with the idea of a weekly challenge. I LOVE being a part of the group! Your card is beautiful. Love the background and the coloring. Got my attention, for sure! I was thinking "why didn't we just call the challenge that?" Now the song is in my head, Lisa! Great card! Love the vibrant colors! Oooh Lisa, again you make such beautiful cards with this image. I like how you added the circle number and love, love the Court Jester paper. Terrific card. Love the stamps & paper choice. Love it! - What a great image and I like how you just colored in portions of it. 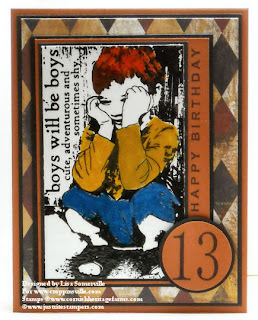 Wonderful papers and great colors make this a fantastic card for you & even old (as some me are just "boys" in larger bodies!). Thank you too for starting this group. I feel I have gained so much from it and have become a better stamper by being "challenged" to think and create outside my normal comfort zone. Your son is going to love this wonderful card. Great job!! What a way to balance great color and masculinity all at once! Super card and great layout! Thanks for all that you do for us in our BC group and as my friend!!! Hugs from MN!!!! Well, Lisa, this card ROCKS! Love the image, the colors, everything about it. Great job as always! Thanks so much for all you do to keep the group going and provide us with inspiration each and every week. I really like the vibrant colors you used on the image--they really make it pop. Lisa, Happy Anniversary! Thank you for allowing me to join this group! Your card is stunning! I love that image and the colors just pop! WOW! This is absolutely WONDERFUL! I love the BG and the colors. Thank you for keeping this group organized and for the challenges. I appreciate being allowed to be part of the group. TFS your fabulous card! Alleluia, It's raining men -- that brought back some fun memories, lol. Thanks for that and all the great challenges every week. You card is wonderful, I love it and so will you son. Lisa, what a great card! I love all the colors you chose, and the patterned paper is wonderful! I love the stamped image as well-you've made some truly great cards with it! Great job with the challenge! This is a WONDERFUL card! Love the colors and vibrancy of it. Great job.